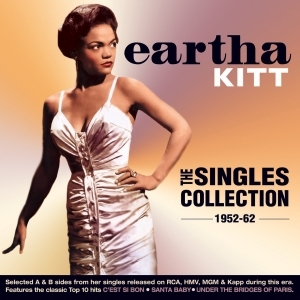 Eartha Kitt was a uniquely distinctive performer, whose sultry and provocative talents as a singer, actress, dancer, comedian and media personality caused the great Orson Welles to describe her as “The most exciting woman in the world”. From humble and troubled beginnings, she found her way to New York and trained in performing arts, making her debut on Broadway in 1945 at the age of eighteen. Her stage work led to a recording contract with RCA in 1952, and during the early ‘50s she had memorable hits, which played on her unmistakeable voice and innuendo-laden overtones with songs like “C’Est Si Bon”, “Santa Baby”, “Under The Bridges Of Paris”, as well as other characteristic recordings like “Let’s Do It” and “Just An Old Fashioned Girl”. She became especially popular in the UK and France as well as her home country, and her often controversial style made her a regular on TV. This great-value 53-track 2-CD collection comprises selected A and B sides of her singles for the RCA, Kapp and MGM labels, including some only released in the UK on HMV, and it provides an entertaining cross-section of her work as well as a great showcase for one of the most individual performers of her era.